Although the 1930s saw a lot of difficulties resulting from the aftermath of The Great War, it also saw a lot of changes and styles, based on a fast paced ever changing world. In quick succession, things were becoming obsolete, and new ideas and technologies were being adopted. For example, in the 1920s, the corsets popularity as a fashion garment, and it’s being regarded as a ‘must have’ item, started to die off so that by the 1930s the populace, in general, had fallen out of love with this piece of clothing. Particularly woman, who for years had been bound and fastened into the corset, much to their discomfort, chose not to wear them. In 1939, when the second world war broke out, the corset soon became unavailable, as metal was needed instead for the war effort. The 1930s was also the time of The Great Depression, but this did not stop the fashion world from developing, or people, in general, wanting to emulate fashions and styles of the times. 1930s dress patterns displayed decorative fancy embellishments such as frills, bows and collars, and 1930s Vintage Sewing Patterns, in general, embraced the zipper in favour of buttons. All of these developments allowed for new sewing techniques and shapes, at a time when money was in short supply and people were struggling to find employment. Regardless of the difficulties, however, glamour and style were not amiss. Spared on by the styles of iconic Hollywood stars such as Fred Astaire and Ginger Rogers, Katherine Hepburn and Clark Gable, the general public looked up to the famous and their fashions associated with them. In the 1930s the waist line had returned to its natural position as the previous decade had seen it lowered. The shoulders on 1930s blouse patterns were enhanced using puffed, banjo or butterfly sleeves, and the torso was emphasized using the above-mentioned decorative touches. The bias cut was also a big hit and 1930s Patterns made good use of a cut that allowed fabrics to fall in a way, so the dresses hugged the natural womanly figure. 1930s coat patterns often had detachable fur collars, adding to the glam, but making it suitable for several seasons. Therefore, cutting down on cost, but keeping up the glamour and flare which was a common part of 1930s fashion. The 1930s accessories patterns feature hats, as this was a common item worn beautifully with coats. 1930s vintage knitting patterns also include embellishments such as bows, collars and puffed sleeves, and intricate patterns and designs could be often seen featured on 1930s knitting patterns in popular women’s magazines and journals of the time. Of course, you can still buy 1930s vintage knitting patterns as well as 1930s Vintage Blouse Sewing Patterns and 1930s Dress Patterns from The Vintage Pattern Shop. 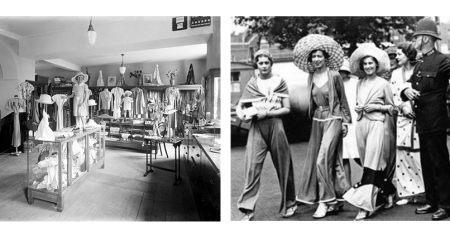 You will see an extensive range of clothing from the 1930s that is ready and waiting for you to create and make your own.